Nigerian President Muhammadu Buhari expressed joy Sunday night at meeting with the 82 Chibok schoolgirls newly freed from Boko Haram extremists — then jolted the country by announcing he was leaving for London immediately for medical checkups as fears for his health continue. “We’ve always made it clear that we will do everything in our power to ensure the freedom & safe return of our daughters” and all captives of Boko Haram, Buhari said on his Twitter account. Minutes later, the 74-year-old president startled Africa’s most populous nation with the news of his departure. Buhari, who has missed three straight weekly Cabinet meetings, spent a month and a half in London on medical leave earlier this year and said he’d never been as sick in his life. The exact nature of his illness remained unclear. “There is no cause for worry” about this latest medical leave, a statement from his office said, adding that the length of Buhari’s stay in London will be determined by his doctors. 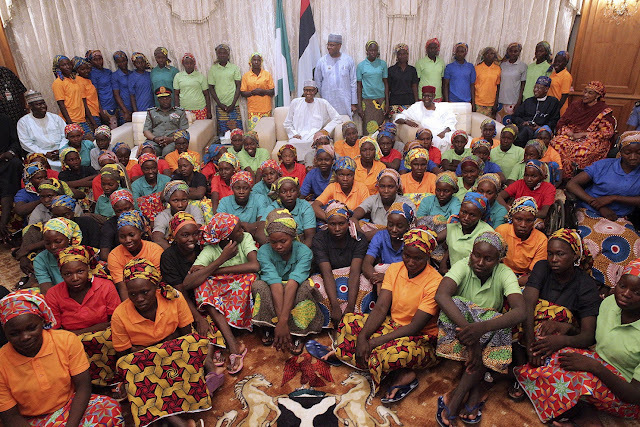 Photos released by the government showed the rail-thin president standing and addressing the Chibok schoolgirls at his official residence Sunday evening, a day after their release. The young women have been handed over to government officials who will supervise their re-entry into society, Adesina said. The International Committee of the Red Cross, which helped negotiate the girls’ release along with the Swiss government, said they would be reunited with their families soon. Five Boko Haram commanders were released in exchange for the girls’ freedom, a Nigerian government official said Sunday. The official spoke on condition of anonymity as he was not authorized to speak to reporters on the matter. Neither Nigeria’s government nor Boko Haram, which has links to the Islamic State group, gave details about the exchange. Parents of the schoolgirls were waiting for a government list of names of those who had been freed. Some parents of the kidnapped girls gathered in the capital, Abuja, to celebrate the release, while others expressed anxiety over the fate of the 113 girls who remain missing after the mass abduction from a Chibok boarding school in 2014. Some parents did not live long enough to see their daughters released, underscoring the tragedy of the three-year saga. And the recovery process is expected to be a long one for the girls, many of whom endured sexual assault during their captivity. Boko Haram seized a total of 276 girls in the 2014 abduction. Girls who escaped early on said some of their classmates had died from illness. Others did not want to come home because they’d been radicalized by their captors, they said. Human rights advocates also fear some of the girls have been used by Boko Haram to carry out suicide bombings. Last year, a first group of 21 Chibok girls was freed in October, and they have been in government care for medical attention, trauma counseling and rehabilitation. Human rights groups have criticized the decision to keep the girls in custody in Abuja, nearly 900 kilometers (560 miles) from Chibok. Though Boko Haram has abducted thousands of people during its eight-year insurgency that has spilled across Nigeria’s borders, the Chibok mass kidnapping horrified the world and brought the extremist group international attention. The Bring Back Our Girls campaign said Sunday it was happy that Nigeria’s government had committed to rescuing the 113 remaining schoolgirls, and it urged the president to “earnestly pursue” the release of everyone held by Boko Haram.